The Royal Road between Beng Mealea, some 60 kms east of Siem Reap, and Preah Khan of Kompong Svay is part of a network of laterite roads built by Angkor's rulers to connect the capital with all the major outlying cities. Today, the ancient road is forgotten, used only by oxcarts and cowherds, though along its length are ancient bridges and temples waiting to be re-discovered. A few of these treasures were the focus of my next trip with my pal Rieng and his father-in-law, and our driver, Heng. Following on from my Banteay Chhmar discoveries, I'd returned to Siem Reap and shifted down a gear into relaxed mode for the rest of the day, eating lunch at The Ivy pub, wandered around the old market and popped into Monument Books, e-mailed my wife and ate supper early at The Red Piano. I returned to the HanumanAlaya guesthouse at 7.30pm to finish off my Jeffery Deaver novel, watch football on the tv and get some shuteye. With an omelette and coffee breakfast finished by 7am, Rieng and Heng collected me half an hour later in their 4WD and we headed east along Route 6, on the first leg of our journey. The number of buses driving at breakneck speeds along the highway had increased dramatically since my last visit in 2003 and I worry for the safety of the residents who live along the road. However, I was pleased to see that between Roluos and the mightily-impressive Angkorean bridge at Spean Praptos, the Cambodian government have deliberately constructed the main highway to avoid another eight, much smaller, laterite bridges from the same era. Most of these have been re-built, contain no more than four or five arches and are minnows in comparison to Spean Praptos, which lies on the outskirts of the town of Kompong Kdei. Without doubt, the largest existing bridge from the Angkorean period, its a fantastic piece of engineering, with 21 laterite arches, its 85 metres long and is topped by an original naga balustrade and four massive naga heads. How these are still in their original location is a miracle but they are well worth investigating, as is the bridge itself. It had taken us ninety minutes to reach Kompong Kdei and we turned left opposite the market, heading for the village of Khvao, a mid-point on the Royal Road between Beng Mealea and Preah Khan. The road to Khvao was fairly good, with occasional pot-holes and broken bridges, as we passed through numerous small villages, where fields were alight to burn off the old rice stalks, and uninhabited forest. As we approached the village of Srong, known for its abundance of laterite, the road was raised high above the level of the fields, which were still flooded. It was 10am and within a couple of kilometres we'd reached our first stop, a school and pagoda containing Prasat Preah Theat, just four kilometres from Khvao. This proved to be an interesting temple and well worth the thirty minute stop. Two large sandstone lions in excellent condition guarded the eastern entrance and path leading to the large single laterite tower. 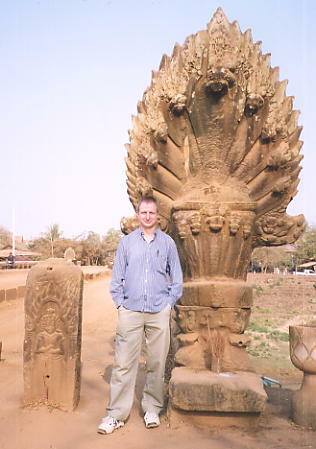 Next to the lions were the remnants of naga heads and smaller lions, with two pools at the far end of the causeway. In front of the tower's only entrance was a collection of Buddha statues surrounding a larger seated Buddha in an open-sided hall. The doorway of the tower contained a damaged lintel, carved colonettes and an inscription on the doorjamb, whilst inside the structure was a revered reclining Buddha with a concrete head replacing the original that had been stolen. On the western side of the tower, two smaller lions guarded that approach. The temple had been a good start to the day, as we arrived in the village of Khvao a little after 10.30am. Heng's work for an NGO had brought him to the area previously and he stopped at the Health Centre to enquire as to the whereabouts of a couple of temple sites I'd heard about near the village. As we waited, the school next door emptied its classrooms and dozens of children in their blue and white uniforms filed past me with lots of smiles and waves and a few nervous looks. Heng re-apppeared, accompanied by Long, one of the medical orderlies, who knew of the temples and bridges along the old Royal Road a kilometre away, and who'd act as our guide. Long directed us along a few sandy tracks before we parked the 4WD in a field behind the village. After a ten minute walk across ricefields, we reached a copse of trees and a laterite enclosure wall, with a broken sandstone entry gopura. Inside the wall, we came across two laterite libraries and a few carved stones and then the main sandstone sanctuary, in ruins and without a roof. The vegetation was thick and made it hard to survey the site properly, though the main temple housed worn lintels, balustered windows and a large hole inside the sanctuary that looked like a two-metre deep well. Long called the temple Prasat Pram, suggesting five towers, though it was impossible to confirm because of the rampant undergrowth. We returned to the village and called in at a small cafe for some drinks and rice supplies before joining the ancient Royal Road for the first time, heading in a westerly direction. On our right-hand side was a large water-filled baray with grazing oxen as we left Khvao and drove along the sandy track for ten kilometres, through Chong Spean village, arriving at our lunch stop just after mid-day. Spean Ta Ong was a major bridge along the Royal Road during its heyday in Angkorean times. Structually identical to Spean Praptos, though smaller, with fourteen laterite arches topped with similar ornamental sandstone nagas and seventy metres in length. One nine-headed naga still stands proud whilst the others are in various stages of ruin. A group of women were washing clothes and themselves on one side of the bridge, whilst we set our mat on the laterite base on the other side, to eat our lunch, next to a large bamboo thicket. With the sun filtering through the trees and the stillness surrounding us, it was a great location for the four of us to enjoy our chicken and beef meal. As we finished, we were joined by a family who knew Long, as all the villagers in the district use the health centre where he works, and who lived in a village a few kilometres further west. We followed them to their village where another bridge, Spean Khmeng, stands. This bridge is similar to the others though smaller, with eight arches and a couple of naga heads still in very good condition, although lying on the ground amongst weeds. Spean Khmeng was as far as our 4WD could go, so we turned around and headed back towards Khvao, stopping enroute at another bridge, Spean Toch (or Bak), a four-arched structure lying abandoned and broken in undergrowth off the main track. On the way to Khvao, we turned off the road and within 100 metres parked the 4WD and walked another 100 mentres to Prasat Ta En, ruined, overgrown and defended by ferocious red ants. The main sanctuary, made of sandstone, appeared to be in the style of a dharmasala or rest house, with half a roof and the walls intact. I noticed some dancing female figures and floral patterns on one of the inner walls but no other decoration. The encroaching vegetation and overhead sun made it a 'hot house' inside the complex. Returning to the village, 200 metres further along the track we came to Spean Khvao, a seven-arched laterite bridge. A naga body and two naga heads were visible - both naga's displayed nine individual heads with Buddha figures underneath. We left the sleepy village of Khvao and this stretch of the Royal Road at 2.30pm, returning Long to the Health Centre with our thanks, having enjoyed a successful visit to this oft-neglected area. By 5pm we were back in Siem Reap, having stopped off for sugar cane drinks at a roadside stall in Kompong Kdei. Two hours later, I was whisked off to Rieng's family home, located off Sivatha Boulevard, for a gorgeous feast of chicken and beef, together with chips especially for me, salad and tiny fried sparrows, as a delicacy! Heng, Rieng, his wife Sovann and I ate at the table whilst the other members of the family, approximately eight of them, dined in an adjoining room. It was a veritable banquet and a great way to end my time in Siem Reap. Afterwards I helped Sovann's teenage sister, Phyrun, who's at high school, with her English pronounciation, which proved to be very entertaining, before returning to my guesthouse by 10pm, and a good night's sleep before my departure for Kompong Thom the next morning.